I’m sure I could write an unending series of stupid things people do that could or have cut their lives short. But perhaps the most common that all of us might do is the act of being a pedestrian. Walking isn’t really an art since we’ve done it from the time we gave up crawling (except for those who get too drunk). Walking is however something that takes attention. If you walk unconsciously, you’re bound to run into trouble. I know someone who was walking and talking with friends, looking sideways, and ran into a pole and smashed her nose. Then we have the infamous jaywalker. In North America, in most places, this is illegal and for a good reason too. It’s not just that you’re taking a chance with your life because you’re too lazy to walk to a corner, but you also disrupt the flow of traffic and could cause a car accident with another car or with you. Is it really worth shaving a few seconds off of your trip? Not to mention, the more walking, the better you keep in shape. I am both a driver and a walker. I walk where I can and don’t take my car if I’m going ten or twenty blocks (on most days). When I’m a driver, I respect pedestrian rights. When I’m a pedestrian I respect car driver rights. Too many people feel entitled, but last I looked no one owns the world. Although pedestrians have the right of way in British Columbia (and many other places) this does not mean they have the right of way in the middle of the street or against lights. At intersections and corners, yes they do but there are still rules. You can’t step right in front of a car and expect them to stop. You would become road pizza. However, in Vancouver I’ve noticed that if you are standing at a corner, most cars will never ever stop for you. I step off of the curb but not in front of the car, and make eye contact. I kinda like my life. When I start walking I have the right of way but even when I hit the lane going in the other direction, I stop first and look, making sure cars are slowing down and stopping. I’ve had people try to run me over halfway through a crosswalk. The best way to end your life is to cross against a light, or run across the street because you just have to catch that bus or get that coffee. In the dark or in Vancouver’s notorious rains, people aren’t always that visible. 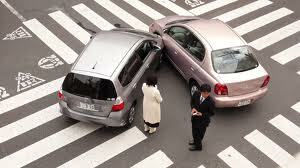 All cars have blind spots and if you run out suddenly, even at a corner, the driver who is turning might not see you. This happened to me once, in the rain, in the dark. All I saw was a flash of legs and it was so sudden. A few seconds different and that person would have been severely injured. BC has intersections with blinking green (or yellow) lights on the main street, and stop signs for the side streets. The blinking light means they’re pedestrian controlled and it takes a person pressing the button to have the light turn red. When the light changes, the cars on the side street can get through. When the light turns red the pedestrian is supposed to stop and let the cars go. Red always means stop, even for pedestrians, yet you’ll find people sauntering across without even looking. And crossing anywhere, whether with the light or if you have the right of way, without looking is a good way to make yourself a smear on the road. Bicyclists and skateboarders (and rollerbladers) who feel that the rules don’t apply to them and think they should go down the middle of the road could find themselves statistics. Yes, pedestrians often have the right of way, but we’re soft flesh and cars are giant metal monsters with exoskeletons. So if you want to end your life sooner than later, walk against the traffic rules or step out in front of a car without looking, because you want to make them brake suddenly. The best thing to remember is respect. Riders, drivers and pedestrians have to respect each other and not feel that they’re the entitled ones where the rules don’t apply. Go talk to the bodies in the morgue and see if disobeying those rules helped them. I have never understood the ghoul mentality, where a person must stop to watch the results of an accident. The worst I ever remember was as a kid when we had gone to Banff (or someplace close by) and seeing the detritus of a fatal accident strewn down the side of a hill. A semi had jackknifed into a family camper, killing the family. There was clothing and other items all over the side of the hill and the ghouls were down there rifling through, picking souvenirs. It would be nice to think they were cleaning up the hillside, but that was not so. Every time I’m on the highway and there is an accident, all the traffic slows down. It makes sense if the accident is in the way and you have to cautiously go around so as not to hit emergency workers and other bystanders. But when the accident is on the other side, or in no way impinging on traffic flow, then why slow down to gawk? Is this an innate curiosity like the proverbial cat’s? If so, then it might just as likely kill you, if you end up affecting traffic flow by staring at an accident instead of watching where you’re driving. This morbid curiosity extends into the fascination for some people with murderers and serial murderers. On the news this week was a piece about memorabilia of serial murderer Clifford Olson being put up for auction. How his items have gone from his prison cell to the online market is supposedly under investigation. But it’s obvious that someone is greedy enough to make a buck and doesn’t care if airing such items related to a perpetrator of horrific crimes further scars the victims’ families. I’ve recently written several pieces of horror fiction. Something I have to ask myself from time to time is why have I written a particular piece. In it, is part of this curiosity that perhaps all humans exhibit: what would cause a person to become a murderer, to go mad? What reasoning would justify murdering to them? Perhaps part of our curiosity comes from not being able to fathom a murderous mind. I’ve written stories that disturb me. Sometimes they’re cautionary tales. At their worst, they’re just for thrill seekers, for those who enjoy being scared with slasher/horror films. True crime books are very popular, and often have redemption in them: the author has written about the murderer after he/she was put away. I never did see Cronenberg’s movie Crash but it had a lot to do with this morbid curiosity taken to the next level and eroticsed. Some curiosity on the workings of a killer mind may be natural, but I really have to wonder at someone so wrapped up in the misfortunes of others and in taking serial murderers to star status. It disturbs me a great deal and I just wonder, in the right, or wrong situation, would such a person’s fascination go that one step farther. I always have to ask myself if I can justify what I wrote. Is there a message or is it just a thrill, whether wanted or unwanted? My answers are not always clear cut.